Chris Renwick's Bread For All sets out to give an account of the history of the British Welfare State, from pre-industrial Poor Laws, up until the foundation of the NHS in 1948. Renwick not only gives us fascinating details about the evolution of our welfare system, but also of the people involved in making it, and those who depend upon it. I've read a number of similar social histories in the past, especially about the post-war Labour government that launched a lot of what we consider the Welfare State today, but what I found really fascinating in Renwick's work is that he really highlights how the Welfare State was a piecemeal development, built up by many different politicians, campaigners and parties over a period of centuries. Labour's post-1945 reforms in this context can be seen more as a centralisation and universalisation of services that existed in various, and generally less generous, forms throughout the industrial era. Renwick's context to all this is the state of crisis that the Welfare State finds itself in today, under the unrelenting cuts of austerity. 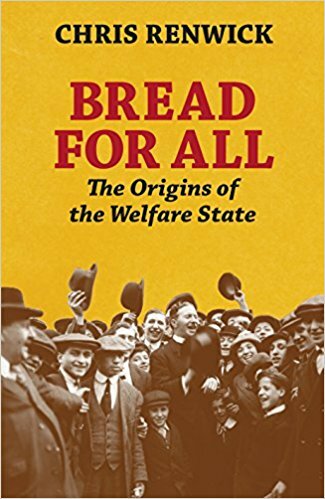 Bread For All also makes clear how vital the Welfare State has been in mitigating the worst effects on the poor of industrial and post-industrial capitalism, and essentially asks us why we do not do more to protect it today - after all we are at risk of losing hundreds of years of progress, that are far more easily lost than they will ever be regained. If you would like to know more about our welfare system, its development, and why we should fight to protect it today, you'll benefit from this book. Request it today at your local library, or you can order your own copy from Amazon here.